I just got had by an odd behavior in the LINQ to SQL model designer when working with a LINQ to SQL Model in a separate class library project. I use LINQ to SQL in a business layer which always lives in a separate assembly and so the model does not live in the same project as the Web (or other) application I'm working on. You can specify a default connection string, and whether you like to use Application Settings to read the value from your config file. This directly maps to the plain ConnectionStrings key specified as you would expect. This is important for a couple of reasons: First using the Model in a class library project requires that you use this configuration settings class so you can't toss it as I often do in my projects. The compiler will let you know if you do and the model will recreate it for you. Heavy handed this, but I can live with that I suppose. Not paying real close attention to the key created in App.Config I just created an entry for JUST TimeTrakkerConnectionString in my web.config file - only to find that the connection string was not respected at all. Now, the ConnectionString key is only used if you use the default parameterless constructor on the DataContext. As an alternative you can also pass an explict connection string and if you want to avoid the business of having Application Settings generated just set the ConnectionString to None. This will cause the DataContext to be generated without the parameterless constructor and you have to pass a connection string instead. You can then subclass the DataContext (or use a wrapper like I do with the business object) to handle passing an application level connection string from whatever source you prefer. However, having the default ConnectionString value there is nice because it makes it easier to write quick sample queries to test operation. I remember this from Typed Datasets as well ... used to drive me bananas. Work around for those was to hand edit the XML and change the connection string to reference the one in the web.config as well. Perhaps this also works for LinqToSQL? Thank You very very!!! Your article help me to fix problem with connection strings. Now when I pass a "connection" instead of passing an entire connection string, I pass the key value from the web.config...and it gets it for me. Rick - This saves me much work. Many thanks. Rick, I'd like to ask if you have ever tried using linq to sql in a data layer with a wcf client? I'm trying this, and I'm having great difficulty with the connection string not being found when I access the data layer via wcf. If I have the client instanciate a business layer object and call the data layer bypassing wcf, the connection is found and it works... but the same client when invoking the endpoint returns an error that the connection string cannot be found. What if you have situation where Integrated Security is not possible. Any suggestions on encrypting the connection string while using LINQ to SQL? It turned out to be this exact connection string problem! The most annoying part of this to me is when you have references to multiple class libraries which reference a common database. Then, using the default implementation, you end up having to have multiple connection strings to the same database in your app.config. Just one extra thing to maintain. Sure, you can edit the generated classes and change things around, but if you have to update the object, it'll all get blown away. Other people have commented on how this is similar to the typed datasets - it is - and that caused me endless problems. If you didn't have the configuration just right, the defaulting to the default connection string meant our production systems were always trying to pull data from our test systems, sometimes successfully ("it looks like it's working..."), which is a very hard defect to track down. @Sam - you can pass in your own connection strings to the DataContext and read them out of a custom Application Setting or other config store. For internal components I always do this exactly for this reason. I typically also add an application wide App.GetDataContext property so I consistently get the right connection string and set it on the DataContext. Still I agree it would have been nicer if the setting was actually overridable where you can specify the appropriate connection string key in config. I've been developing a Windows Forms application based on LINQ-to-SQL and I've always wanted to to be able to override the default connection parameters the app.config file. I came across a few solutions on the net, but there was no assurance that the references would not get blasted away each time I edited the DataContext object using the graphical editor. I didn't quite figure it out initially and had ignored it until now as it was not critical. I knew that I could explicitly reference the connection as an argument to the data context in each instance but that would be, well, ugly. Instantiating a new DataContext object each time with no arguments just seemed so much more elegant! "MyDataContextBase" is the actual data context that I work with in the graphical editor, and "MyDataContext" the data context class I refer to in my code. The solution is pretty simple really and I don't think the code needs much explanation. All I am doing is deriving "MyDataContext" from "MyDataContextBase" (the real data context), and passing in string read from the static property "ConnectionParams.ConnectionString". "ConnectionParams.ConnectionString" will return the connection string named "myConnectionString" from the app.config file. Chances are that you aren't correctly referencing a valid SQL connection string (one that works). I recommend that you hardcode your connection string into your partial class constructor first, makes sure it works, then after that use that same connection string in your web.config where you can then reference with the ConfigurationManager. The fact that DataSet Adapter or Linq to SQL have a reference to a global variable with connection is complete and utter insanity. The whole Properties thing is. VS should not create it by default in a Class Library project. The only time it's useful when you have Application/Main, or in a Web Application. Hello, I have this problem. The firts method is gone, y ever must write again. You can help me, please. Thanks Rick! I was scratching my head on this one for a while. I set the connection to (None) as you suggest, forcing clients of my .dll to provide a connection string, but I have found that each time you modify the data context it re-sets the connection properties. That is somewhat irksome, but I can live with it. 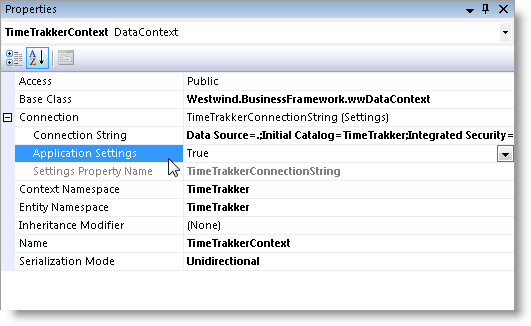 your first screenshot shows how you edit the Connection on the datacontext, I can't find this window in my VS2010 solution. I have a DBML file which doesn't have those properties. How could I connect two databases in SQL SERVER 2008 using linq to sql and c# in the file .dbml or my DataContext. I want to know if this is possible. Also I have all my classes in a folder that includes the project. @Narling - you need two separate DataContexts and .dbml files for that to work I think. You can possibly run raw data commands over ADO.NET on that same connection, but I don't think you can use LINQ in this scenario. Ok so what do I put if I want my dbml inside my class library to use the connectionstrings in my web application web configs?